Portugal – some end of week pictures! I’ve been promising you these pictures for ages now, it’s really lashing outside now (raining heavily for all you non Irish out there!) but looking at these again brings a smile to my face and reminds me of the wonderful time we all had together in sunny Portugal! I loved the huge selection of high quality and diverse work produced during the week, these photo’s really only give you a little idea of what we were up to!!! This was the first time that I had facilitated such a long workshop and I found it very interesting to see that as the week developed everyone settled down into the felting with gusto. Being together at a workshop over a longer than usual period of time was very relaxing and inspiring, staying in such a beautiful rural setting and being served delicious food and drink every day added wonderfully to the experience! More happy faces, thanks Fernanda for looking after our cooking needs so well! Our group all gathered together for the last time! Relax, unwind and recharge your felting mojo! 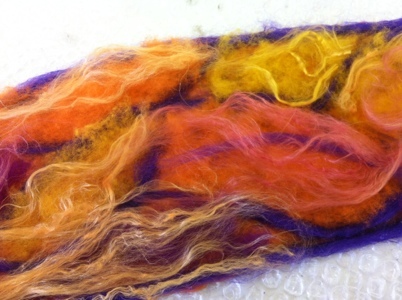 Come and join me at Clasheen from 7th – 10th August for a fun filled felting extravaganza. This recession busting mid-week break is the ideal opportunity to tackle new projects or work towards perfecting techniques in a fun and creative atmosphere. The emphasis during the retreat will be on participants having fun, extending their felting practice and sharing techniques, for those wanting a structured experience I will demonstrate and share my method of incorporating raw fleece into bags and rugs as well as share how I use the tumble dryer to felt larger nuno projects. I will be on hand to guide and answer any questions for the less experienced felter; I’ll also be felting myself and am really looking forward to working on a new jumper/dress idea! Participants are free to use my studio from early morning until 11pm and there’s a wealth of interesting plant material and old rusty bits of iron around for anyone wanting to try out a little bit of eco bundling or rust dyeing! The total fee for this residential retreat is E220 incl comfortable shared accommodation on site, DIY breakfast and lunch (from a well stocked kitchen) plus a catered evening meal with wine to help us unwind in the evenings, vegetarians are welcome! 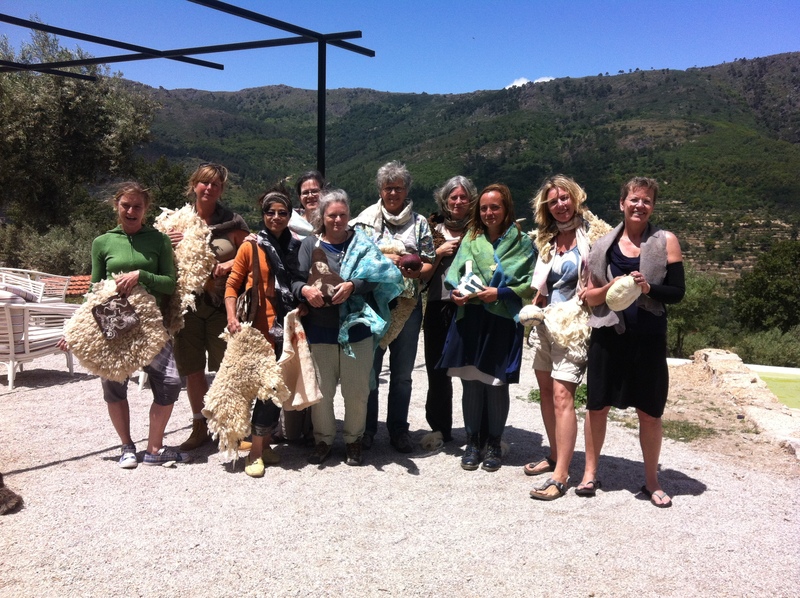 Felting equipment and materials are not included in the fee but I will have a good selection of short fibred merino, silk, raw fleece and other natural undyed wool available for participants to purchase for individual projects as well as bubble wrap and laminate floor underlay available by the metre. 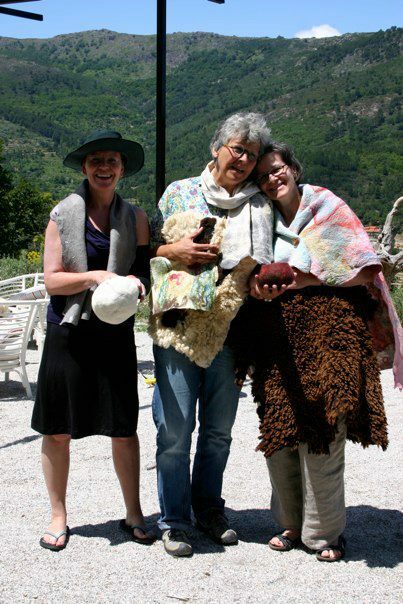 This retreat is suitable for participants with all levels of felting experience, the emphasis for the retreat will be fun, fibre, felt, food and friends! 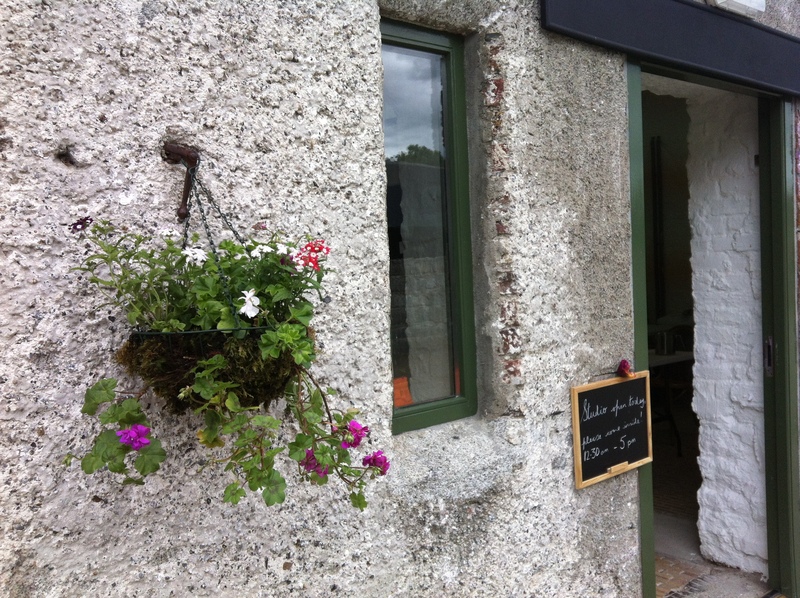 Friday 10th Check out is by 10am – Borris Country Market takes place on Friday morning and Cushendale Woollen Mill is just 6 miles away at Graiguenamanagh, this is a wonderful spot to visit, gorgeous locally produced and dyed yarns as well as weaving! Please email me asap if you would like to reserve a place, confirmation of booking will be on receipt of the full fee via PayPal or cheque. 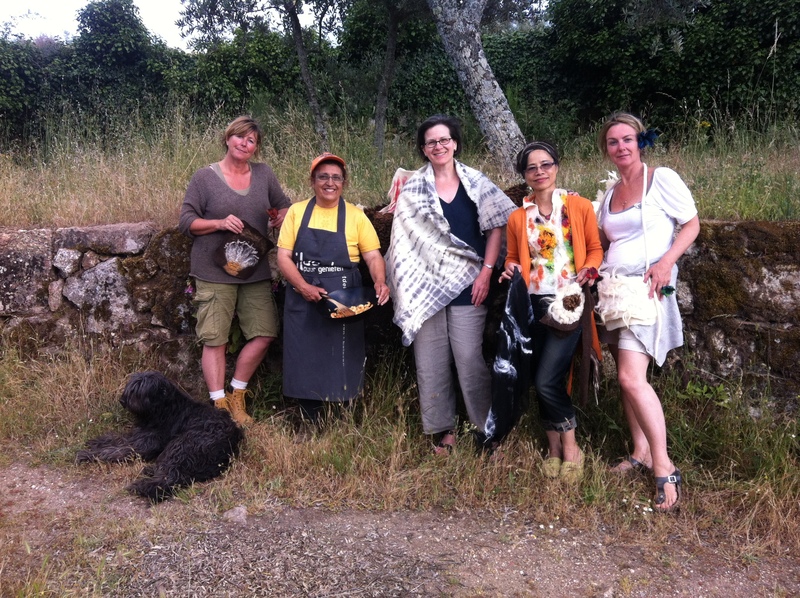 Felting retreat alert at Clasheen and workshops, current and past! Final pictures of more finished work from Portugal on their way I promise, there’s just so much catching up to do and I don’t want to forget to advertise upcoming workshops too! I had a really fun weekend felting and teaching for the first time at Duckett’s Grove, congratulations Maya and Valerie, you both felted wonderful pieces for your first time felting. Head on over to my FB page to see pictures of the beautiful flat felt and fun flowers they created, please like the page too if it appeals to you and you haven’t already done so! Next Saturday I’m running another full day ‘Simple, Stylish and Colourful Flat Felt’ workshop for beginners and improvers, details over on the workshop page and if you’d like to reserve your place please email me asap. On Sunday felt flowers are the theme again. From 2 until 4pm I’ll be hosting my normal workshop costing E25 (incl materials) where you learn the basics for a variety of flowers with and without stems. Integrating stamens and/or ring backs are also options for more experienced felters and everyone will felt at least two or three complete flowers using the special short fibre merino I love to work with for jewellery. To celebrate Duckett’s Grove hosting Carlow Garden Festival on Sunday afternoon I’m also going to offer short 15 – 20 minute taster sessions costing E10 per flower throughout the day. At these sessions I won’t be doing any actual teaching but rather have the lay out done in advance (simple flowers with no stems) and participants will just have the felting to do, I will of course supervise this and think it could be fun! I’d now like to alert you all to an exciting bit of news, I’ve decided to host an intensive but relaxing residential felting retreat (hopefully not too late in the day!) at Clasheen. I’ll confirm it next post with all the fibre related details but for now put 7th – 10th August in your diaries, the idea is for this to be an affordable and creative mid week break!!! Participants will stay in ‘Tom’s House’ (the adjoining rental property), felt in my studio and be wined and dined in the evenings, watch this space! Descriptions for my September workshops at The Tin Thimble in Loomis CA are now online and I’m sure Emma won’t mind that I’ve copied and pasted her text here for you to review (please be advised though that I won’t be teaching anyone how to make a skrit, that should of course read skirt!). Please email Emma asap if you are interested in coming along and joining us, these classes are almost full now I think and it’s always such a fun place to teach and meet fibre friends. This one day workshop will share with participants the skills needed to felt a wonderful vessel or large purse with integrated shoulder strap. Depending on felting previous experience participants will have the opportunity to experiement with adding inclusions such as stones, glass nuggets or other found objects into their felt. Vessels will be strong and sculptural, purses may include internal pockets and interesting flaps and closures. This one day workshop will encourage participants to explore and experiment with a variety of wet felt techniques and discover ways in which they may be combined to create unique felt jewelry and accessories. During the day participants will be able to felt a selection of buttons, belts, brooches, bracelets, necklaces, purses, closures or other small three dimensional items and all the techniques discussed and learnt may be translated into larger three dimensional felt or clothing. Found objects and treasured bits and bobs may all be incorporated into the felt so participants are encouraged to bring along a selection of their favourite stash items and Nicola will help them design one off pieces using these as a starting point. I think that I’m going to settle into a nice rhythm after a couple of weeks, experimental felting and large nuno wraps while I’m not at Duckett’s Grove or Borris Food and Craft Market followed by easy smaller projects plus teaching over the weekends. My new hanging basket will provide some live as opposed to felt flowers at the door of the studio! I still have a lot of my personal pieces of felt on display in the new studio but with time I hope to have a lot more new felt for sale as well as interesting supplies to tempt the fancy, more in another post. For now I need to load up some chairs into the truck, walk Rex, change my clothes then organise everything for tomorrow. I’ll leave you with a picture of the vessel I was working on yesterday using the open resist method (the smaller one), I enjoyed felting some new fun felt flowers this afternoon! 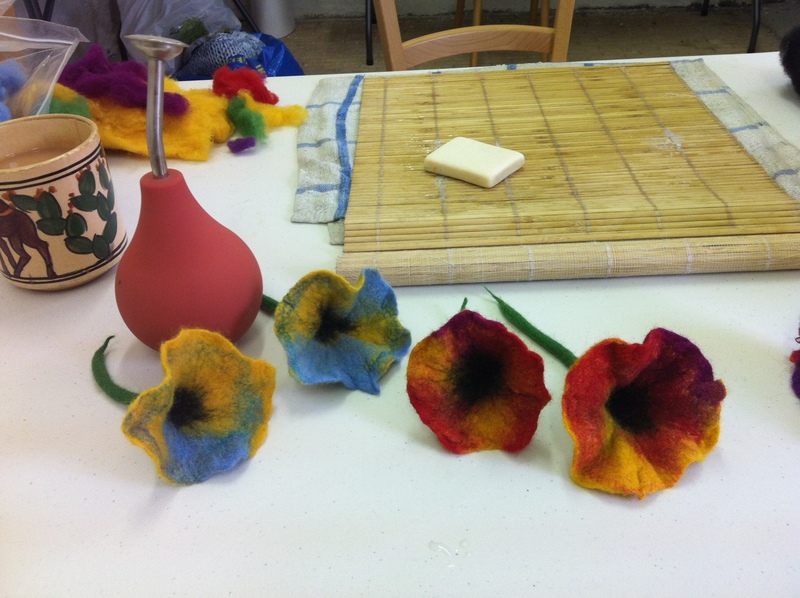 Longer post on Monday…..
‘Flat Felt’ and ‘Fun Felt Flower’ workshops at Duckett’s Grove this weekend! I’ve just updated my workshop page! 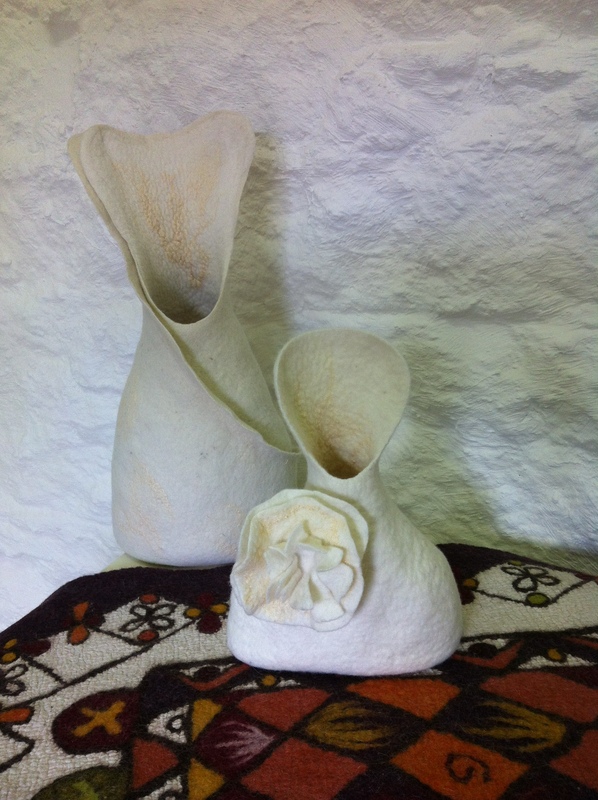 Why not come and join me in Duckett’s Grove this weekend and try out felting for the first time or add new skills to your repertoire?? ?